History of Hyrule: While the Greek Gods have created the whole planet one piece of the planet that was a wasteland without life. One day 3 goddesses descended to the wasteland. Din the goddess of power use her flaming arms to create the red earth. Nayru the Goddess of Wisdom poured her wisdom onto the land with the spirit of law restoring order to the land. Farore the goddess of courage with her rich soul created life that will uphold the law. With their labors complete the goddesses ascended departed to the heavens living behind a sacred relic of their power the Triforce. The land was known as Hyrule. The first demigods: Years went by since the creation of Hyrule. Din descended into Hyrule in a form of a gerudo woman. The Gerudo king fell in love with her and they had their first son Ganondorf making him the first demigod. 16 years later Nayru and Farore descended to Hyrule in the form of Hylian maidens. the King of Hyrule fell in love with Nayru and they both had a daughter name Princess Zelda the second demigod. A knight that serves the royal family fell in love with Farore and they gave birth to their son Link the third demigod. 17 years later Din discover her son Ganondorf became the king of evil and became known as Ganon. Luckily Link & Zelda with their power of light seal the dark king away. Worried that if she has another child they might become evil that she vowed never to have any children again. The second demigods: Years went by and Hyrule slowly disappear becoming a legend and it is in the Northwest territory of Oregon,Washington and the northern part of California. Cellus a soldier of Kronos wants to resurrect the evil titan but he discover the triforce that could grant any wish. He plan to use the lifeless body of Ganon to bring back Kronos. So far he has the Triforce of Power and he needs the Triforce of Wisdom and Corage. Chiron was inform of this that he assign Percy,Annabeth and Grover to search and bring the 2 demigods to Camp Half Blood who bears the mark of the Triforce. Percy thought that it was only a video game but not knowing its real. 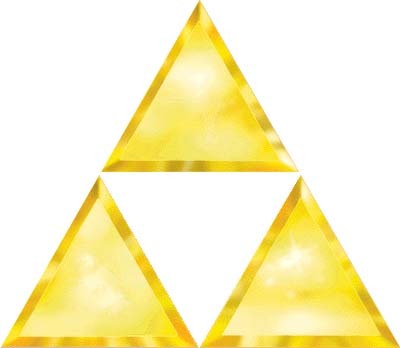 This is the mark that only the triforce children bear. Parent: Farore the goddess of courage. Description: Alec is the descendant of Link and best friends with Nayru's demigod daughter and descendant of Princess Zelda. He wields the Master Sword and Hylian Shield. He bears the Triforce of Courage in his left hand. Well I can't think of anything for that. I don't see a triforce of courage on his left hand, or a sword and shield. that shows the character appearance.